U.S. researchers found a correlation between inadequate vitamin D levels and the amount of narcotic medication taken by patients who have chronic pain. Researchers at the Mayo Clinic in Rochester, Minn., found chronic pain patients who required narcotic pain medication, and who also had inadequate levels of vitamin D, were taking much higher doses of pain medication -- nearly twice as much -- as those who had adequate levels. The study, published in the journal Pain Medicine, also found the patients with the lower levels of vitamin D self-reported worse physical functioning and worse overall health perception. "This is an important finding as we continue to investigate the causes of chronic pain," lead author Dr. Michael Turner said in a statement. 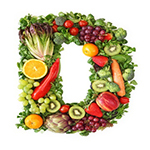 "Vitamin D is known to promote both bone and muscle strength. Conversely, deficiency is an under-recognized source of diffuse pain and impaired neuromuscular functioning. By recognizing it, physicians can significantly improve their patients' pain, function and quality of life." The researchers studied 267 chronic pain patients admitted to the Mayo Comprehensive Pain Rehabilitation Center from February-December 2006. Vitamin D levels at the time of admission were compared to other parameters such as the amount and duration of narcotic pain medication usage; self-reported levels of pain, emotional distress, physical functioning and health perception; and demographic information such as gender, age, diagnosis and body mass index.